This past year, we purchased an “Instrument 1” made by Artiphon for the UNI Spectrum Project (spectrumproject.org). 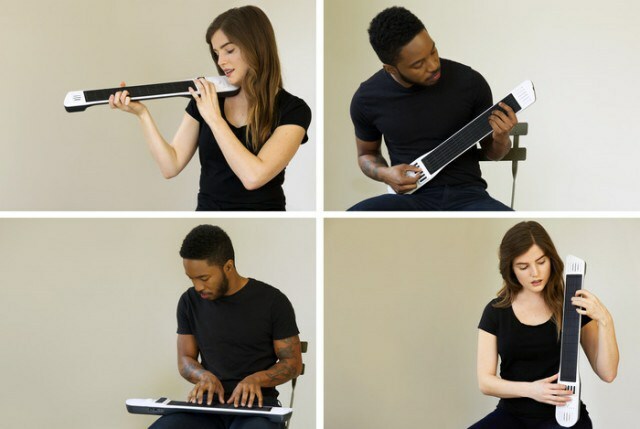 It is a MIDI controller that is a combination of a guitar, violin, keyboard and drum pad (https://artiphon.com). To work, it needs to be connected to an iPhone, iPad or computer. Once connected, the music and sounds come out of a built-in speaker on the Instrument 1. The sounds and the responsiveness of the Instrument 1 can be controlled through the app. On the Instrument 1 itself, you can control volume and change between sounds/functions. There are settings for guitar, violin, keyboard, drums and four pre-sets. The bridge of the Instrument 1 is comprised of 6 raised pieces of rubber that can represent strings on a guitar or a violin. You can strum it like guitar (ukulele, banjo or mandolin), wiggle it for a violin or tap it in drum mode. As opposed to other instruments, the Instrument 1 does resemble more of a guitar because the rubber pieces extend from the instrument and move, unlike other guitar simulators that are fixed or an iPad of glass. Addition to strumming, you can also fingerpick the Instrument 1. Fingerpicking more that 3 fingers (2 fingers & thumb) is difficult because the rubber “strings” are not that long. In violin mode, wiggling the bridge will add vibrato and sustain. The main body of the Instrument 1 is a rubber fretboard with frets. There are 12 raised frets with 6 raised strings. These are not real strings that move like the bridge. They are raised rubber lines. Since the fretboard works as a guitar, keyboard and drum pad, all the frets are equally spaced from each other. This means as you get closer to the bridge, the frets don’t get closer together. For guitarist and violinists, this can be a strange feeling. In guitar and violin mode, the frets won’t play unless you strum the bridge (no hammer-ons or pull-offs). In keyboard mode, it can turn into 72 individual keys or 12 keys (one per fret). In drum mode, they become 12 drum pads plus 6 drum pads on the bridge (i.e., all hammer-ons). Using the app, the fretboard and bridge are fully programmable to any note or scale. The app comes with many pre-programmed instrument sounds including guitars, string instruments, keyboards, drums and synthesizers. The Instrument 1 can also be used with other apps like GarageBand, ThumbJam, SampleTank and others. There are four programmable settings to save your favorite sounds and functions. These settings are easily switchable from the Instrument 1 itself by pushing the volume knob, not needing to go to the app. The Instrument 1 can be set on a table to play, on the lap, on the shoulder (violin) or played like a guitar using the strap (extra cost). This makes it very versatile for different learners who need to hold the instrument in different ways. Since the sound comes out of the Instrument 1, it provides immediate feedback of sound. This is different from other instruments like the Skoog where the sound comes from the iPad or iPhone, not the Skoog itself. The Instrument 1 is very programmable and adaptable to many situations. The possibilities of sounds are endless using other apps. It has many functions so there is usually at least one that a student will like. Tapping on the pads to play the drums is easy. It doesn’t take a lot of force to play. Strumming feels like you are actually strumming an instrument and makes it sound more even. No Bluetooth connectivity. It is always connected to a device. Violin (or viola) playing doesn’t actually feel like a violin. Frets are equally spaced (con for guitar and violin mode only). Price (maybe) - $399 seems a little high for regular commercial electronic instruments, but low for adaptive electronic instruments.